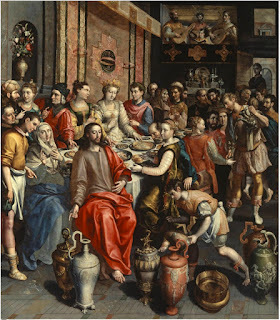 And when the chief steward had tasted the water made wine, and knew not whence it was, but the waiters knew who had drawn the water; the chief steward calleth the bridegroom, And saith to him: Every man at first setteth forth good wine, and when men have well drunk, then that which is worse. But thou hast kept the good wine until now. This beginning of miracles did Jesus in Cana of Galilee; and manifested his glory, and his disciples believed in him. The Holy Hour for Pro-Life is this Wednesday from 6:30-7:30 PM. This Saturday, January 19th, the Rosary and Altar Society will meet to pray the Rosary and have breakfast following the 8 AM Mass. Also on Saturday, the Friends of St. Dominic Savio meet from 3-4:30 PM.